Conquering acne naturally is a huge achievement, and can bring a whole new shine to your self-confidence. 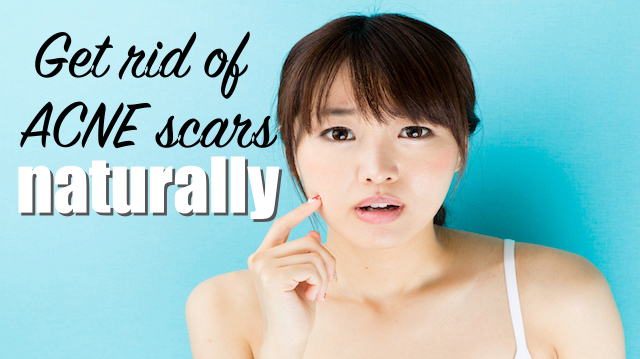 Unfortunately, many of us are left with unsightly scars and dull, welted skin that presents a whole new problem. Conventional wisdom says that scars are forever. We are told that at best we might reduce their appearance with expensive and painful repeated cosmetic procedures. Lasers, anyone? Since we believe in affordable, comfortable, and most importantly, natural approaches to every beauty problem, we did the research on simple remedies for acne scars. These solutions aren’t scary and won’t cost a whole paycheck. Here are some of the simplest, safest and most effective ways to encourage skin regeneration and get rid of acne scars. You might find some of them already in your kitchen! Aloe vera gel: The gel from inside aloe vera leaves is rich in vitamins and antioxidants that deliver a super healing boost to the skin. It is very gentle and won’t cause any irritation to those with sensitive skin. All you need to do is purchase some pure aloe vera gel — or break a leaf off a plant if you have one — and massage the gel into the skin. Leave on for 30 minutes before rinsing off. Repeat this process daily. Coconut oil: Coconut oil has amazing restorative effects on the skin, and works as a great follow-up to the aloe treatment described above. Simply rub a little coconut oil between your palms and then massage into the face and neck. The vitamins and essential fatty acids will work away at the skin and improve appearance over time. Cucumber: This cooling vegetable not only helps soothe inflammation — which could be a cause of acne — it also nourishes and hydrates the skin. Cucumber has a high water content and is rich in vitamin A, vitamin C and magnesium. All of these nutrients are helpful for skin health and encourage regeneration. All you need to do is cut a few slices from an organic cucumber and lay them on top of damaged skin for 30 minutes. This is the perfect time for meditation or reading, if you can do it without the slices slipping off! This gentle treatment can be repeated as often as desired. Lemon: Among the many healing properties of lemon is the ability to fade scars and regenerate skin. The juice contains alpha-hydroxy acid, which is often extracted and used in cosmetics. Simply dab the juice onto acne scars with a cotton swab and leave it on for a few minutes until the juice has dried. Then rinse and follow up with a nourishing oil to moisturize. However, do not apply this treatment right before heading outside. Citrus tends to increase the skin’s sensitivity to the sun, and it may make you more prone to burning. Raw apple cider vinegar: This amazing remedy also contains alpha-hydroxy acid similar to lemon juice. Experts say it helps to fade marks on the skin, balance oil production and encourage a smooth texture. To make a revitalizing toner, mix one part apple cider vinegar with two parts distilled water. Apply to the skin with a cotton pad following cleansing but before moisturizing, being careful not to get any in your eyes. Olive oil: This nourishing oil is anti-inflammatory and provides vitamins A, E, and C to revitalize skin. Try massaging a small amount into skin after cleansing and before going to bed. Potato juice: Yes, it sounds strange, but the juice of raw potatoes is rich in a number of nutrients that can be helpful with skin regeneration. Simply cut off a few slices and lay them over the skin, or use thicker slices to perform a circular massage of any scar-affected areas. Let the juice soak in, then rinse off and apply a moisturizing oil like those described in this list. Tomatoes: Ready for one of the stranger ones on this list? We are going to recommend that you make a guacamole-esque mask for your face! That’s right, place one tomato, half a cucumber and half an avocado in a food processor, and pulse until smooth. It may be necessary to strain the mixture to get rid of some of the water if it is too wet. Apply this to the skin and leave it on for 15 to 20 minutes before rinsing. This is an incredibly nourishing and moisturizing antioxidant treatment that will make acne scars disappear in no time. Tea tree oil: This healing essential oil is great for drying out acne pimples before they become a problem, but it’s also helpful for scars. In particular, raised and red scars, which often result from cystic acne, are known to benefit from tea tree oil. Be sure to purchase a good quality oil since cheaper ones can cause skin irritation. Rosehip seed oil: Here is yet another highly beneficial oil for healing scarred skin. It contains retinoic acid (a form of vitamin A), which is used in many commercial products. Simply massage a small amount of the lightweight oil into the skin once or twice daily to see benefits. Apricot kernel oil: The oil made from apricot pits is rich in vitamin E and skin-nourishing fatty acids. This is a great option to use as a moisturizer. The oil is light and absorbs well into the skin. Apply daily for best results. Another option is to use pure vitamin E gel, which you can purchase in a bottle or squeeze out of vitamin E capsules. Essential oils: Try mixing essential oils such as lavender, sage, fenugreek or sandalwood into the olive oil, coconut oil, rosehip oil or apricot kernel oil that you use as a moisturizer. These essential oils are known to encourage the fading of scars. There are a few ways to banish acne and prevent scars from forming in the first place. Using baking soda as a face wash is a great way to do this. The gentle exfoliating action and its deep-cleansing, disinfecting properties make baking soda the perfect thing to encourage smooth skin and keep future pimples from popping up. We recommend mixing about half a teaspoon with a tablespoon of raw honey and using this as an exfoliating wash. The raw honey is a rich emollient (effective moisturizer) and also encourages wound healing and disinfection. After letting the scrub sit for a minute or two, rinse with warm water and apply a nourishing oil like apricot kernel or sweet almond as a moisturizer. Alternatively, replace the baking soda with ground cinnamon for an antioxidant punch. Another option for the exfoliating ingredient is to use crushed aspirin tablets, which contain salicylic acid, a good skin regenerator. Experiment to see which feels best on your skin. Don’t let those acne scars bring you down or cramp your style. Be persistent with these gentle yet effective remedies and see your naturally clear skin shine through! Read more about foods that may cause acne here. Next articleIs Exercise a Natural Fountain of Youth for Your Body? Hey Buddy!, I found this information for you: "12 Things That Make Acne Scars Disappear Naturally". Here is the website link: https://www.thealternativedaily.com/make-acne-scars-disappear-naturally/. Thank you.